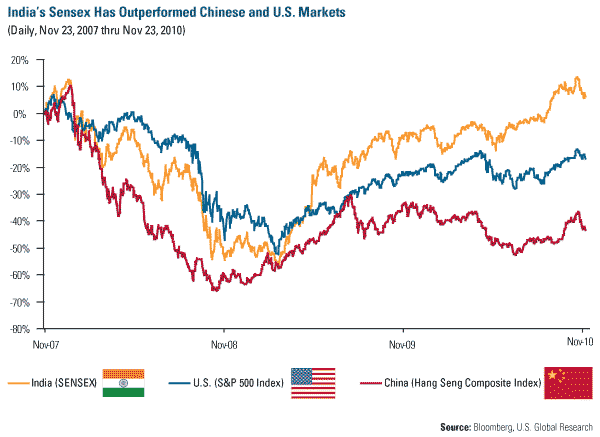 Indian markets have rebounded nicely from the crisis, outperforming both the U.S. and China over the past three years. As of November 23, India’s Sensex was up just over 6 percent for the past three years, while the S&P 500 Index was down more than 16 percent and China’s Hang Seng Index was down 43 percent over the same time period. Looking out for the next 5-10 years, India has one of the strongest growth profiles of any major economy in the world. Rapid urbanization, favorable demographics, key government policy reforms and further globalization of the world economy have India poised to match China’s GDP growth of 8.5-9.5 percent over the next two years before possibly outpacing Chinese growth for the next decade. The McKinsey Global Institute (MGI) believes India is on the verge of the second greatest urban migration the world has ever seen. 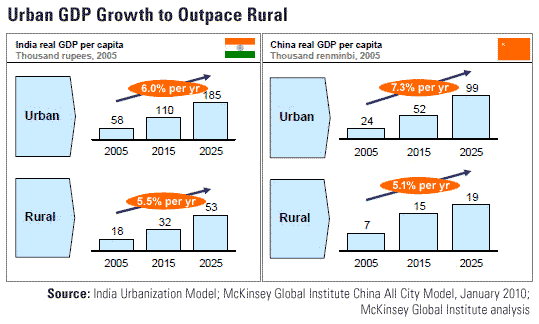 MGI sees India’s urban population ballooning to 590 million—nearly twice the size of the United States—by 2030. This urbanization could send shockwaves through the global commodity balance. Currently India accounts for just 3.8 percent and 4.8 percent of the world’s metals and primary energy demand, respectively, but Barclays is projecting that India’s metals and primary energy demand will increase by 80 percent and 50 percent, respectively, over the next five years. 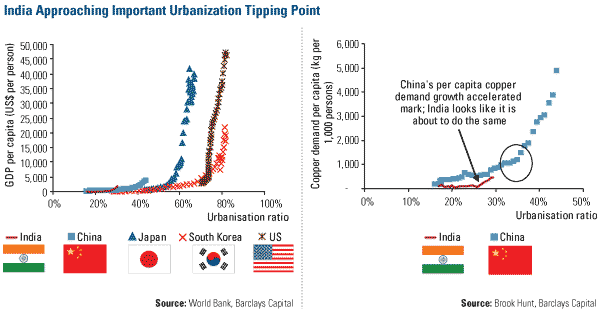 India is approaching a tipping point in terms of urbanization. As you can see in both of these charts, once China reached the key 30 percent level of urbanization, both commodity demand and GDP per capita took off. As the population’s discretionary income increases, people tend to use their money to improve living conditions by buying goods or adding utilities such as running water and electricity to their homes. MGI estimates that the number of Indian households with discretionary spending could jump from just 13 million in 2005 to 89 million by 2025. MGI says discretionary spending will account for 70 percent of consumption growth. This urban population will not only be wealthier, it will also be younger and better educated than prior generations. The age dependency ratio, which is the ratio of population that is either below or above working age, is expected to shrink from 67.7 percent of the population in 1991 to just over 48 percent of the population by 2025. This means India will have a youthful labor force of roughly 900 million who can adapt easily to advances in technology and other shifts in the global economy. This anticipated massive urban migration is going to strain India’s cities, airports and roadways so the government is quickly taking steps to expand its existing infrastructure. Currently the government spends 7 percent of the country’s GDP on infrastructure but that is expected to rise to 10 percent of GDP over the next few years, according to Morgan Stanley. That is roughly equal to what China is currently spending on its infrastructure. This year, infrastructure lending has led the banking sector in 2010. According to CLSA, infrastructure lending from the Reserve Bank of India is up 80 percent from the same time period last year. Last December I traveled through the Punjab region of India and there is no doubt the country has a long way to go. The roads are crowded, airports inadequate, and sewer systems non-existent, but when I spoke to people I immediately saw the feeling of hope this population carries with it. These people have firmly grasped the American Dream and it is only a matter of time before it comes true. The Hang Seng Composite Index is a market capitalization-weighted index that comprises the top 200 companies listed on Stock Exchange of Hong Kong, based on average market cap for the 12 months. The Bombay Stock Exchange Sensitive Index (Sensex) is a cap-weighted index. The selection of the index members has been made on the basis of liquidity, depth, and floating-stock-adjustment depth and industry representation. Sensex has a base date and value of 100 on 1978-1979. The index uses free float. The S&P 500 Stock Index is a widely recognized capitalization-weighted index of 500 common stock prices in U.S. companies.